Author Written by Velmurugan Saravanavelu and last updated on Posted on April 30, 2017 . Welcome to the tutorial about SAP Bill of Materials (BOM) in SAP PP. This tutorial is part of our free SAP PP Training course. In this tutorial, we will explain what is BOM in SAP, how to create it, meaning of various fields in BOM master data, and how to change existing bills of materials. SAP bill of materials (BOM) is one of the elements of SAP PP master data which contains information like list of components and their quantities required to produce an assembly or a finished good (FG). In SAP, different BOM categories are available which are used in different applications or functional areas of an organization. MRP uses BOM to calculate required raw materials or semi-finished goods (SFG) or components quantity for customer demand of finished materials. MRP performs ‘Net Requirement Calculation’ at all the level of BOM by exploding it to determine the shortage quantity. 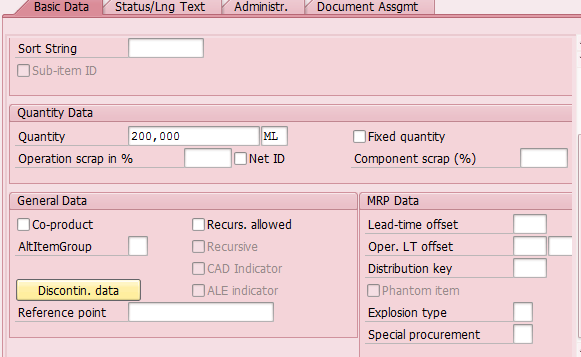 During finished good (FG) product costing, the SAP system performs costing of its component by exploding BOM. Product costing comprise of raw material, activity and overhead costs. Here, raw material price is maintained in a material master and its required quantity for a particular FG is maintained in BOM. During product costing, the SAP system multiplies quantity in BOM with material master price to determine its cost against the particular FG. 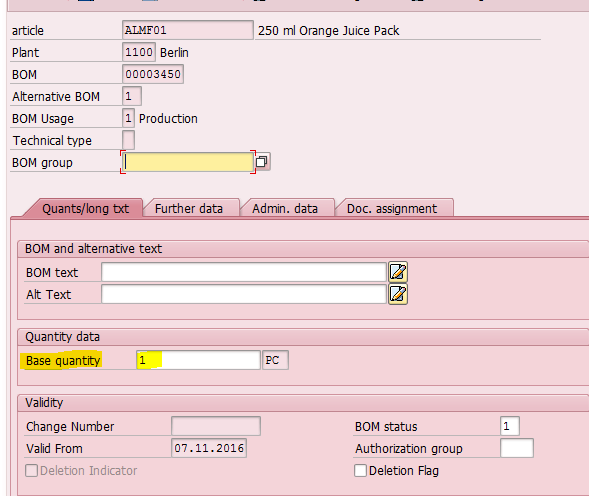 When production order is created for an assembly or FG, its BOM components are copied to the order. At the time of goods issue against order, the system posts the consumption based on this BOM components in an order. Here, the end product is same but its components are different. Here, the end products are different but having common or similar parts like frame, saddles, etc. and a variant part. BOM explosion means break down of an assembly from a higher level to components in lower levels. The SAP system breaks down the assembly by means of its lower level codes. Lower level codes will be assigned by the system automatically when an item is linked with the BOM. When one material is appearing in several assembly BOM at different levels, the system represents the lowest low level code. We can display the lower level code of a material in a material master (transaction MM03) (additional data menu item or by clicking button). 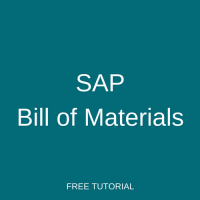 How to Create SAP Bill of Materials? A material master must exist for all assemblies and components before creating a BOM. Here BOM Usage controls application or business function that can use this Bill of Materials. For example, BOM of a product in a design phase will have the usage ‘2’ which cannot be used for production purposes. In component overview, the SAP system shows all the components required to produce the assembly (for base quantity). 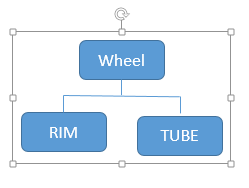 Each BOM has a unique structure which is applicable for all BOM types as illustrated below. This number is assigned internally by the system. System uses this for linking with transaction data and other PP applications like MRP, production order, etc. This field represents an alternate BOM if more than one BOM exists for the material. This field tells which technical types the BOM belongs to. 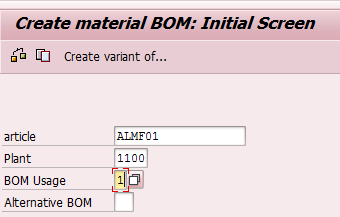 When we create a BOM for an assembly, the SAP system creates Alternate ‘1’ with technical type “ “ (Blank). This is the quantity for which component quantity will be entered. This base quantity will be used in BOM explosion at the time of MRP and costing. Stock Item Item can be kept in stock. The SAP system generates reservation at the time of order creation. Non-Stock Item Item cannot be kept in stock, may be procured directly at the time of consumption. 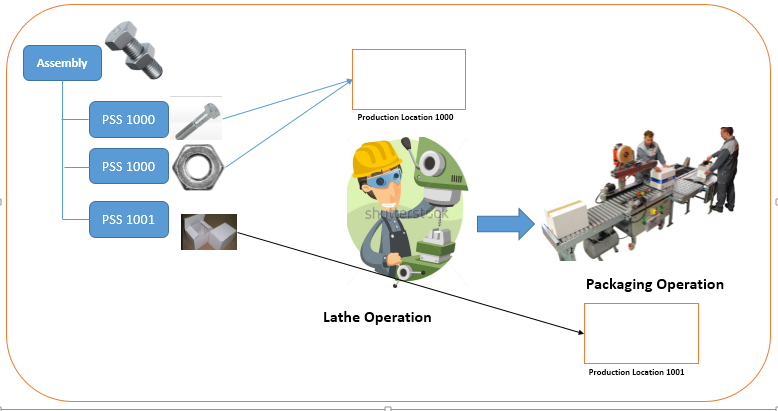 The SAP system generates PR or Planned order at the time of Order creation. Variable Size Item Different sized materials are assigned with this item category. Required quantity is calculated based on Sizes and Formula entered. PM Structure Item This item category will be used only for Plant maintenance BOM. Intra Material Temporary material which exist between 2 operations/phases. Commonly used in Process Industry. Document Item Document (design, drawing, photos, etc.) can be assigned to the BOM as an item using this Item category. A valid document master record is required for this. Text Item A text required for shop floor paper can be maintained here. Class Item This item category is used for configurable material to classify the materials. When component quantity is not based on an assembly quantity and always consumed in fixed amount, this indicator can be used. Catalyst used for a chemical process is always fixed without respect to quantity of FG produced. Component scrap can also be entered in BOM as well as in a material master. Component scrap maintained in a material master is applicable for all BOM products. When different component scrap percentage is required for particular product, it can be maintained in BOM. Here, the system will only consider the operation scrap percentage entered here and not include assembly scrap (if any) entered in the MRP-1 view of a material master. Let say requirement quantity of R1 and R2 is 100 PCs. Co-Product Indicator is activated if more than one finished product is produced in a production process. Material which are defined as co-product will be entered with (negative sign). This means, that a particular material will be considered as “Output Material” along with the header material. Material entered with a negative sign but no co-product indicator is activated will be consider as a “By-product”. In foundry process, liquid metal is produced by melting charge materials like ion, brass, etc. They are melted and poured into a mold to form a casting. During the melting process unconsumed liquid metal also consumed in every cycle. Here input and output materials are the same which cause recursion in BOM. It leads to the situation when BOM will be exploded indefinitely without stopping. By setting the indicator recursive allowed at BOM item level BOM explosion will be stopped. 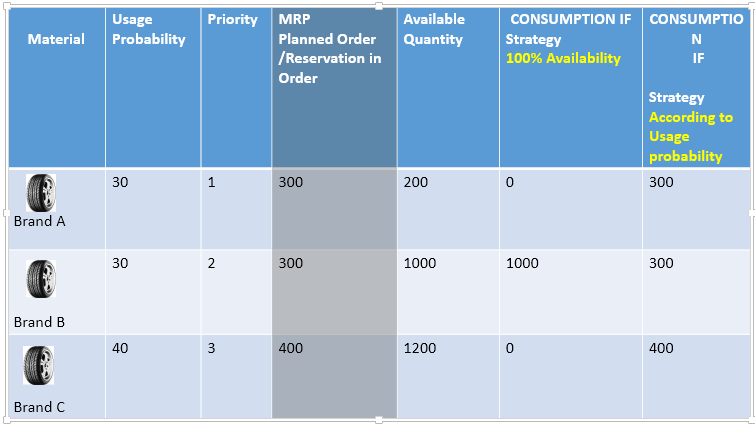 MRP uses Usage Probability and Priority to create dependent requirements. Production order also creates reservations based on Usage Probability. But consumption is based on Strategy defined in the alternate item group. Let say a company manufactures a car where different brands of tires are used to fit in the car. Depending upon availability, a suitable tire will be used by the system. Let’s say requirement for a tire (based on car requirement) is 1000 PC and below settings were maintained in BOM items for an Alternate Items Tire Brand A, Tire Brand B, and Tire Brand C.
Discontinuation material is a material which is replaced by its follow-up material. We can maintain a discontinuation material in SAP material master as well as in SAP bill of materials. Bill of materials setting override material master record setting. MRP will transfer the dependent requirement to follow-up material if discontinued component is no longer in stock or has insufficient stock. We cannot activate discontinuation logic for Alternate Items. Co-products cannot be discontinuation items. Non-stock items cannot be discontinuation items. 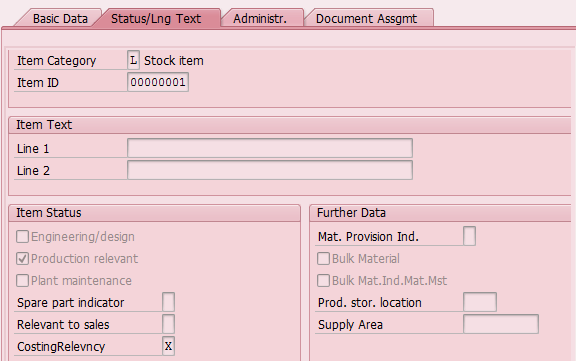 Based on Sort String, the SAP system will sort the component’s display in report and PP transactions. This Indicator will be activated by default for BOM usage ‘1’ and ‘3’. If this indicator is activated, the item is relevant for material planning and production orders. For items which you want to use only for costing purposes but not for planning and production orders uses like bulk materials, this indicator can be deactivated. This Indicator will be activated by default for BOM usage ‘2’. Usage of this BOM in other application like costing, production is optional. Item that is relevant for Plant Maintenance will be set by default for usage ‘4’. It is generally used in Plant Maintenance (equipment BOM) which can be assigned to the equipment operations. Item relevancy for costing is decided by this Indicator. On deselecting this Indicator, Particular BOM Item will be excluded from Costing but not relevant for Production/Planning. This Indicator controls relevancy for MRP. Generally, it is used for subcontracting materials. If subcontracting components are provided by the production plant, no need to activate this indicator. So that MRP generates dependent requirement for the components. If components are not provided by the production plant and are already available at a vendor’s location, activate this indicator. So that MRP will not plan or generate dependent requirements. Item will not be relevant for costing. Dependent requirement will not be generated by MRP. There will not be any production storage location for this item to issue store from, as it is directly available at Machine/Work center location. Replenishment is based on consumption based planning. If a Material is used as a bulk material for all products, we can set it in its material master (MRP2 view). 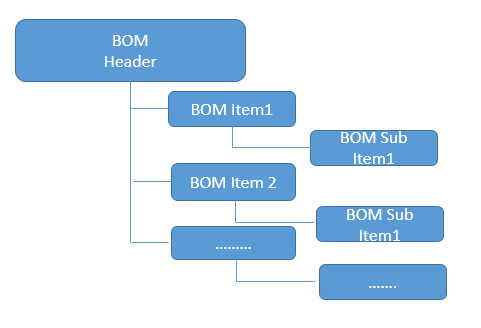 If it is used for some products and not for every product, we can set it at BOM item level. Location from which raw materials /components are consumed for production. On release of a production order, a warehouse person will issue the material from the warehouse to a production storage location. 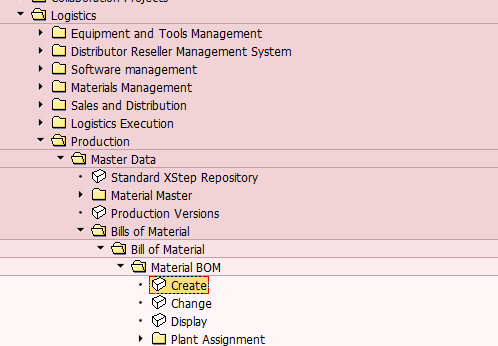 Production storage location in BOM item has a higher priority than the location in a material master (MRP2 view). How to Change SAP Bill of Material? Change item data like quantity, etc. Did you like this tutorial? Have any questions or comments? We would love to hear your feedback in the comments section below. It’d be a big help for us, and hopefully it’s something we can address for you in improvement of our free SAP PP tutorials. You need to use a different transaction for this purpose: CS20 and/or CEWB. I hope that we will make another tutorial on this topic in the future. Thank you for the question! Wonderful training – thanks for putting this together and making it available. Does anyone know a SAP transaction where if I have a raw material code, I can find all the finished goods the raw material is contained in? So for example, I input the Saddles item code, and the results give me Bicycle Model A, Bicycle Model B, and Bicycle Model C. Thanks! Have you tried transaction CS15? Awesome, that works. Thank you! I’m analysing consumption (MB51), and I’m trying to work out if a particular consumption is assigned to a BOM. How do I do this? I don’t think you can see it from MB51. Try Zimbabwe Dairy Board – I implemented it SAP-PP there back in the late nineties. They will be using SAP. As far as training goes, I think you will need to attend training at SAP in South Africa. Is there any way to add alternative “production storage location” – (psl). I’ve got material that is on two different storage location. For me it would be greate if there will be 0 on stock at psl A, and then system is loking for stock at psl B. We can define only default storage location in BOM item level . For determining stock based on some rule we need to define “Stock determination group” in customization where you can maintain it for a plant and enter in which sequence you want to determine the storage locations. This stock determination group need to be assigned with Material master MRP2 View. Thank You for such quick reply. Do You have any manual to do “Stock determination group”? Pl let know how to map single child with multiple header in Engineer change number in SAP. Do you have a question and want it to be answered ASAP? Post it on our FORUM here --> SAP FORUM! What is SAP Reconciliation Account? How to Choose SAP Module? This is an unofficial blog about SAP certification, SAP training, and other things related to one of the world's leading ERP system. This blog is independent and NOT affiliated with SAP SE (the company behind SAP ERP system). Your usage of this website signifies your agreement with our terms and conditions. We would be happy to hear your feedback or questions.